The alumni are ready to do one more sprint drill. 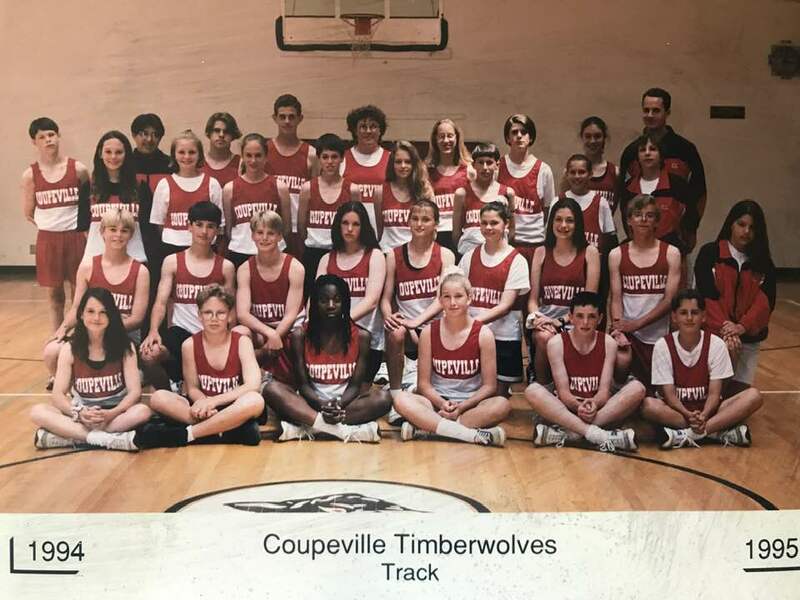 Thanks to a photo found in an old album, the 1994-1995 Coupeville Middle School track and field squad lives again. A big part of the fun of unearthing pics like this is trying to recognize the younger versions of athletes who went on to be stars. After some back-and-forth on Facebook, we know Michael Meyer, Jess Roundy, Devyn Barron, April Ellsworth-Bagby, Kellen Ward, David Torres and others are present. So, how many can you ID? With Meyer (second from left, bottom row) rockin’ his middle school mane of curly hair, he was the first I knew for sure. When this photo was taken, he, and the other members of the CHS Class of 2000, were in 7th grade. Meanwhile, I was in my first year of working for his mom, Miriam, having started my 12-year run at Videoville in Oct., 1994. So that means … checks my notes … I’m old.